21 3 Blackjack | Play Online with Our Leading Featured Casinos! 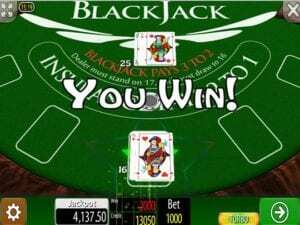 21 3 Blackjack is a side bet Blackjack adaptation developed and patented by Derek Webb in 2000. 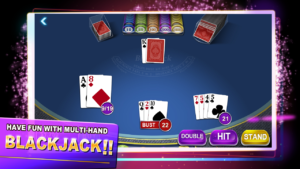 The game combines Blackjack and Three-card Poker. Therefore a three-card hand is a combination of the first two cards and the dealer’s face-up card. 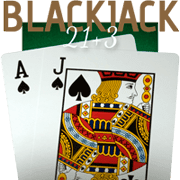 There are three versions of 21 3 Blackjack online and there will be no doubt more in the future. Indeed, players heading on a casino pilgrimage often discover 21 3 Blackjack in Vegas casinos. So it’s enjoyed worldwide. Moreover, with using the 21 3 Blackjack method, 21 3 Blackjack payouts are generally more so players can potentially win more money! In 21 3 Blackjack, you try to beat the Dealer by amassing a card value close to but not exceeding 21 points. So standard Blackjack. However, the wagering is slightly different here. Additionally, players can then also make a 3-card side bet which pays independently to the first 2-card combination and the Dealer up card. You get two face-up cards and the Dealer receives one card face up. If you decide to make a 3-card bet, winnings are paid relative to the side bet pay table and these first 3 cards can be a great result. 21 3 is essentially the Blackjack game with the Side Bet 21 3 as an extra bonus. Therefore two bets running concurrently. It’s certainly an interesting way to possibly improve your chances of winning more. Moreover, many of the sites we feature offer 21 3 Blackjack online free so why not try a taster session today or even try your luck for real? 21 3 rules are based on European Blackjack rules. The dealer doesn’t check for Blackjack. Your splits and doubles will be lost if the dealer has a natural which is built on 6 deck games. The 21 3 Blackjack odds are estimated. But odds are generally better with 21 3 Blackjack meaning greater potential winnings. You can double or hit split hands including Aces. It is usually played with 6 standard decks. The dealer stands on all 17s. It is split up to 2 hands including Aces. Doubled down hands receive one card. Six decks of cards are used and shuffled after each hand of play. Players are given the chance to act on their hands by hitting (taking a card), doubling, down standing or splitting. The goal is to try and beat the dealer by amassing a card value total closest to 21 without going over. Aces are valued as either one or eleven and face cards count as 10. 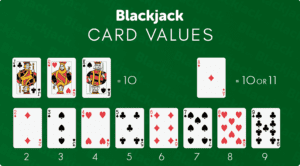 An ace combined with a face card on the original two cards is a Blackjack for the player and pays 3-2. Recommendations Regarding 21 3 Blackjack Strategy. These other points are certainly worth keeping in mind to super-hone your 21 3 Blackjack strategy! If your game is shuffled manually and is trackable, consider a new shuffle or using an automatic shuffler. Be aware of single players who play the wager at specific times. These players may be using a shuffle stalking approach and when they play it is a maximum bet. Look out for a team of players who all play large stages on a bet at the same time. These players may be using a card counting method. (There is a software tool -the Interactive Card Counting Trainer which teaches you how to count cards accurately). The Blackjack side bets payouts are what makes this game different. It has the capacity to pay up to 100-1 on the original wager. The first 3 up cards of a hand are turned into a 3-card Poker hand that can lead to success. While the proper portion of the game involves a combination of skill and luck this side bet is based solely on luck. So keep that in mind during play. It is certainly in your interests to learn the rules and strategies before you head off to Vegas and take on 21 3 Blackjack.